In addition to our canine-assisted swimming program, we offer drowning prevention, education and water safety. Classes are held in both pools and other natural bodies of water. ​Cori's human counter-part is Jodi Powell from Special Fishies Aquatic Freedom & Education. Together, they work as a team with each child. Both Jodi and Cori received personalized training from ​SICS - Squadra Italiana Cani Salvataggio - Scuola Italiana Cani Salvataggio, AKA The Italian School of Water Rescue Dogs. In Italy, the dogs work with the Coastguard to save the lives of people who are drowning. The dogs actually patrol the beach, acting as lifeguards. 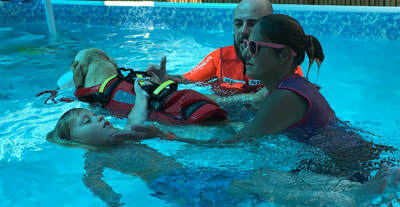 Although we don't have a similar program in the US, we have added their techniques into our canine-assisted swimming, water rescue and drowning prevention programs. ​You can get additional information on Jodi and Cori's credentials on our canine-assisted swimming page. ​Any time water is nearby, whether in the bathtub, backyard, public pool, part of the environment or any other type of water, hypervigilance needs to be a priority. Even if you're not swimming, a child can be drawn to water. It only takes a second for a child to stray if they aren't 100% supervised, and they can drown in less than a minute. We often think drowning comes with a lot screaming and splashing, but it can be a deafening silence. Even a child who knows how to swim can drown. Swimming in the ocean brings additional risks as the currents can take a child away in seconds. Life jackets won't help a child if they aren't wearing one. Swimming lessons are important, but total supervision is paramount. ​In addition to our safety and drowning prevention efforts, we are very active in raising awareness. Cori acts as an advocate and takes her job of water safety very seriously. ​Having a dog involved provides a non-judgmental aspect to the sensitive subject of drowning. In addition, kids are more eager to learn about safety when they have a furry friend to help teach them. Our goal is to educate and prevent drownings from happening. We have created a unique way in which to do so. Dogs make a difference in people's lives every day. Cori not only wants to make a difference in their lives... she wants to save their lives. ​​In this video, when Cori sees the child go down the slide, she jumps in the pool to make sure he's ok. Then she stands on the deck watching the other child in the pool. Her eyes keep darting from one child to the other. Her facial expressions and body language show concern. It's like she thinks it's not safe for the kids to be playing around like this. Her anxiety escalates, and she starts barking. She is trying to inform us that this behavior isn't safe. ​This is how seriously she takes her job. Her instinct for water safety and drowning prevention is strong. As such, we are committed to helping her fulfill her mission to save the lives of children. ​Our canine-assisted swim program isn’t just about learning how to swim. We also advocate and raise awareness of water safety in general. Even if a child knows how to swim, they can still drown. Therefore, we request that families practice safety skills consistently and continuously year round. • Be aware of any body of water, including buckets, toilets and tubs. • Pool has a 5 foot fence around it. • Teach kids how to turn around and reach up for the wall & practice during each lesson. • Practice safety skills during each swim lesson. • Teach students and parents how to call for help. • Designate a specific instructor to supervise all kids, not just those in lessons. • Always swim with an instructor or buddy if you swim outside of a lesson. • Encourage all family members to learn to swim. • Minimize and avoid distractions while supervising children in or around water. • Keep first aid kit on site. • Keep multiple U.S. Coast Guard approved life jackets of different sizes at pool. • Keep reaching device at pool. • Keep throwing device and buoys at pool. • Only class participants are allowed in the water during lessons. • Siblings must remain quietly on the deck. • Nobody enters the pool area without an instructor. • Practice hypervigilance around the pool. • Let kids know that they should contact the lifeguard or an adult if there's an emergency. • Be aware of wandering behaviors, and pay close attention. 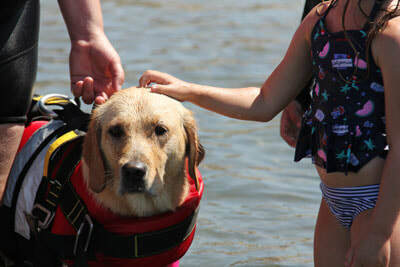 • Our dogs wear life jackets with handles on the back because they are used as assistive devices in the water. Please visit our canine-assisted swimming page too. ​It has a lot more information, photos and videos.